The Fellowship was fortunate enough to obtain a copy of GROO: FRIENDS AND FOES #5 from Dark Horse Comics. The story is by Sergio Aragones and Mark Evanier, with art by Aragones, colors by Michael Atiyeh and Caitlin McCarthy, and letters by Stan Sakai. A long-lasting war of words between Queen Grooella (Groo’s sister) and King Comino has escalated to a real war. Grooella sends her forces to attack where Comino’s forces train. However it was a deception, leaving Grooella’s kingdom (I mean Queendom) open for invasion. Realizing the situation, a risky plan was hatched, much to Grooella’s displeasure. What happens next, well…you have to see for yourself. It has been such a treat to see Groo in action (and comedy) again. While each member of Groo’s “circle” is the focus of this series, his sharp blades and dull wit shine through every issue. Aragones and Evanier can put these stories out until the end of time and I will still read and enjoy them. These are fun, humorous tales that anyone of any age can enjoy. If you haven’t checked this series out, your missing something. But it’s not too late! 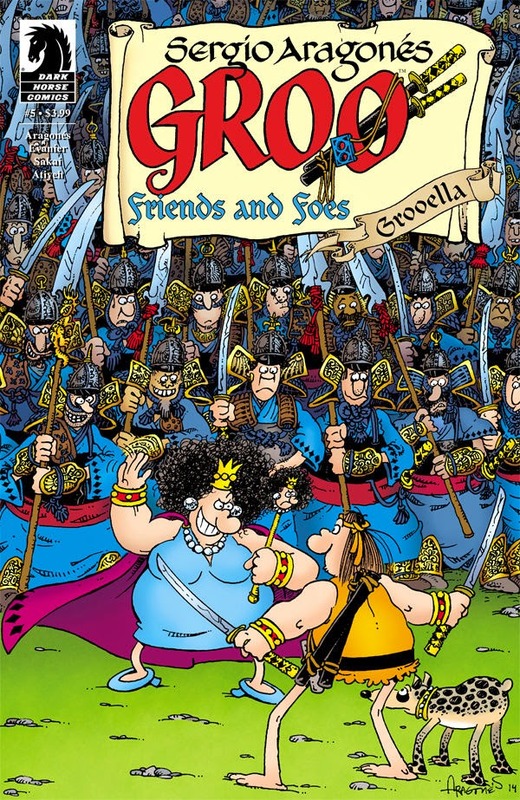 GROO: FRIENDS AND FOES #5 is in stores now, or available for ordering at www.darkhorse.com.